Q: Tell me about yourself. What is your background? "My name is Liz Walker and I have been a participant in Dagorhir Battle Games Association, Inc. for nearly 13 years. Over the course of my experience I have become a chapter leader and help operate the local chapter in Indianapolis, Mittelmarch. Dagorhir is a federally registered nonprofit recreational group. Each chapter runs its own events: battles, practices, feasts, and campouts. “Realms” (as many members refer to chapters when speaking “in character”) range from small, new groups up to some with hundreds of members." Q: What materials do you use? Do you incorporate duct tape into your projects? "Duct tape is one of the primary materials for constructing the majority of our weapons. For a basic sword, we start with a fiberglass or kitespar core, then glue on a couple layers of foam. We add a strip of duct tape to the side of the weapon and to any gaps to maintain construction." Q: What do you like to use duct tape? "Duct tape is very durable despite how much activity we experience with our weapons. They can be made with various materials but duct tape tends to outlast other products. Safety is of the upmost importance, as Dagorhir is a very physical sport. While serious injuries are very rare, minor injuries can result from being hit by weapons or altercations with other participants, and we want to make sure we are building them to last (and be safe)." Q: How did you get involved with this activity? "I started foam fighting 13 years ago; my neighbor had a pile of weapons in his backyard for the neighborhood to play with. I was hooked! Since then, the “technology” of our weapons has changed quite a bit but we still always use duct tape in some way." "Although Dagorhir originally focused on combat and role play, the culture of Dagorhir has expanded to include medieval arts and science, crafting and other ways to enrich the Dagorhir experiences. 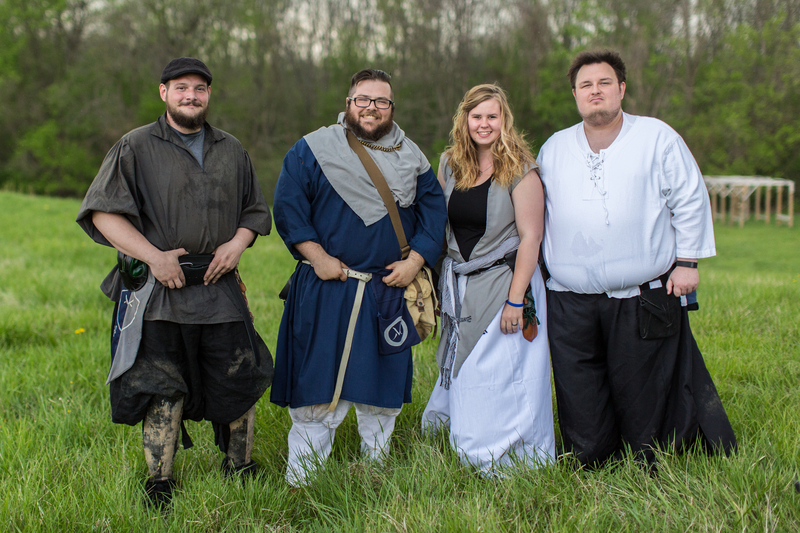 Even persons who are not interested in the combat side of Dagorhir (non-combatants) find rewarding experiences at events. This culture yielded many people, myself included, to enjoy making weapons for other people in the game." Q: What motivates you to continue to create? "I have a strong desire to see safe weapons on the field, constructed in a way that lasts a long time and has less risk of harming someone. I build arrows and I have developed a careful technique that uses minimal resources (adding minimal weight) while ensuring maximum safety." Q: How is your personality reflected in your work? "I feel a lot more confident taking the field with my arrows, or seeing other arrows on the field I have made, knowing they won’t hurt other players. I trust my craftsmanship and it makes me a more confident fighter." "Most of our weapons follow general guidelines for construction based on the weapon type, but the look and feel (color of tape, for example), varies. Most creators lean toward neutral colors purely because we are trying to remain somewhat “period” with the way our weapons look." "There are various steps and all are generally, at least at the base layer, constructed the same, making the process of building weapons actually very relaxing." Q: Do you have a favorite piece that you've created? "As I mentioned, I love building arrowheads. I also love building shields, as they are an important piece of equipment that tends to last many years. It’s nice to have one piece of gear that stays with you throughout many fighting seasons." Q: How do you use your imagination with what you do? "Participants (called “Dagorhirrim”) create an alternate persona for the game. This persona can be as involved as the person likes–some create elaborate backstories and character genealogies, others just select an alternate name to be known by in the game." Q: What role do you as a creator have in society? "As someone who participates in an organization that is a little “outside the box,” I feel obligated to encourage others to do the same thing, and be a “creator” in their own way. I want others to find an outlet that encourages them to be their best self and be passionate about, like I have."